The Hercules MS300B Low-Profile Tilt Base Microphone Stand is equipped with a Quik-N-EZ Height Adjustment Lever that slides up and automatically locks into place for easy, instant adjustment. Simply press the lever to lower. Also features a Quik-N-EZ Mic Clip The Quik-N-EZ Mic Clip mounts with a flip of the lever and is rubber-lined for a secure grip. It fits all mic stands without top washers and accepts mic sizes: 20-35 mm. 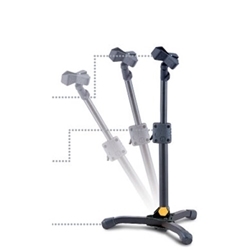 The Tilting Base with Swivel Legs give you a fully adjustable stand angle and swiveling legs that fit around other stands, drums and stage equipment. Perfect for tight spaces and difficult-to-reach spots.